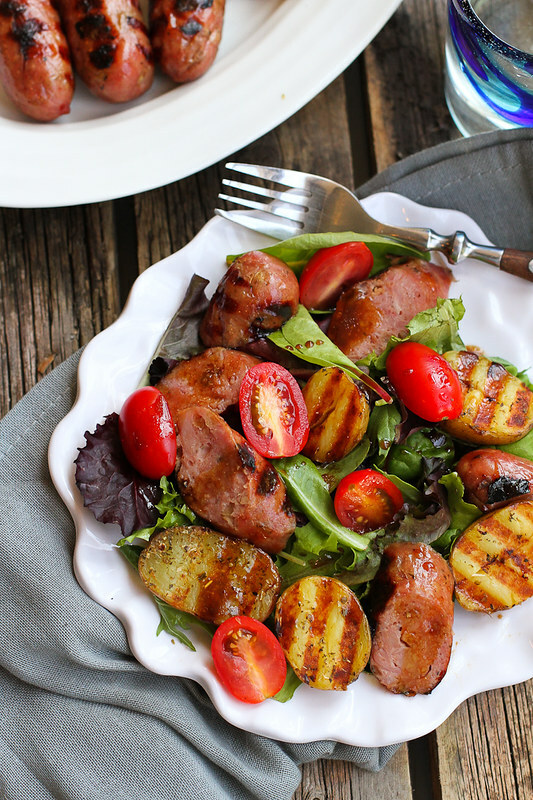 The next time you’re making a grilled sausage recipe, grill up some potatoes at the same time to top this delicious green salad! 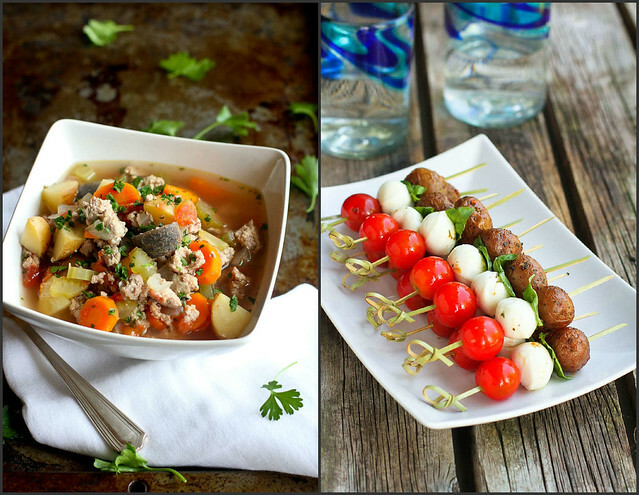 292 calories and 8 Weight Watchers Freestyle SP. Thank you to The Little Potato Company for helping me share this recipe with you. There is one phrase that my kids utter that is music to my ears. “Mum, can we make dinner tonight?” Okay, so it’s not actually better than “I love you” or something similarly heartstring-tugging, but it definitely ranks right up there. Their favorite thing to make is pasta with pesto, chicken sausage and vegetables, but they’ve also branched out to Baked Fish with Pesto & Breadcrumbs and dinner salads. They cook, we clean up. Cue happy parents! 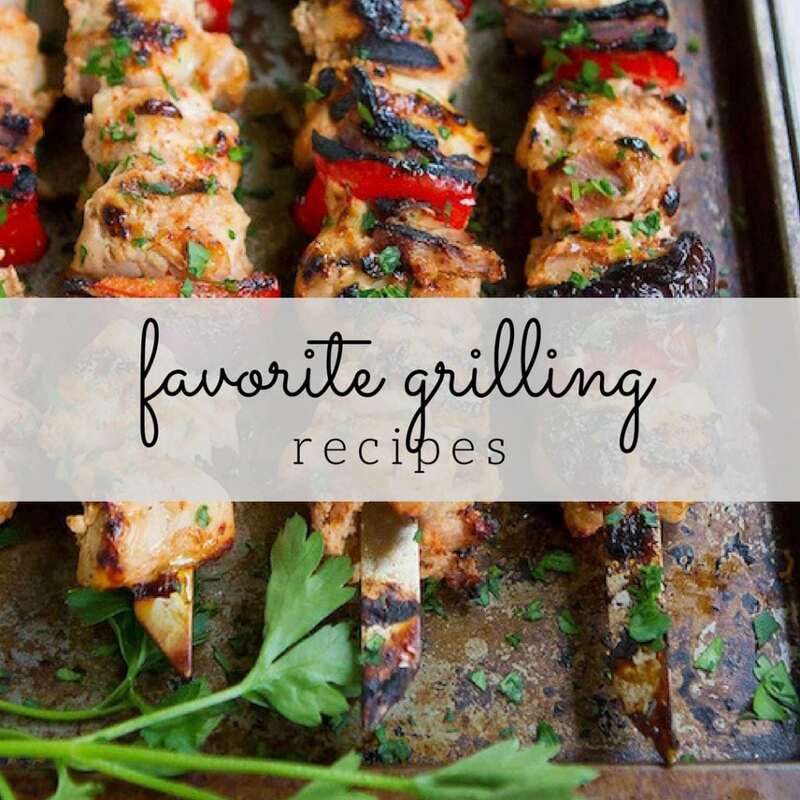 Now that the boys are becoming more comfortable with the oven and stovetop, the next step is the grill. Considering it’s their most requested grilled meal, we started with sausages. Perfect for my budding chefs! 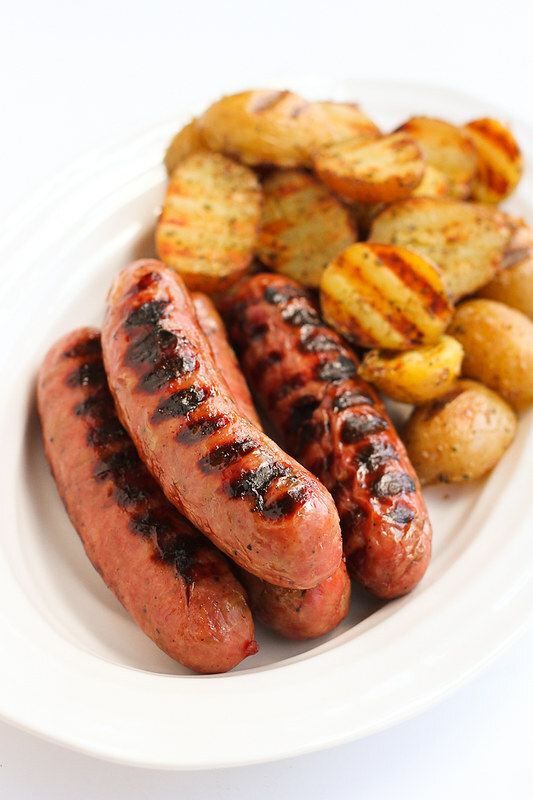 And with The Little Potato Company‘s dedication to developing recipes for Little Chefs, it seemed like the perfect time to do double duty on the grill, with both sausages and potatoes. Typically, I buy the 1.5 pound bags of Creamer potatoes at the grocery store, but was elated to find the 5-pound bags on our last Costco shopping trip. In fact, I stood by the display of potatoes for several minutes, extolling their texture and flavor to any who stopped by. It’s amazing how quickly my family disappears when I start chatting with strangers about my love for a particular product. For this recipe, boil the potatoes until they are just tender when pierced with a fork. 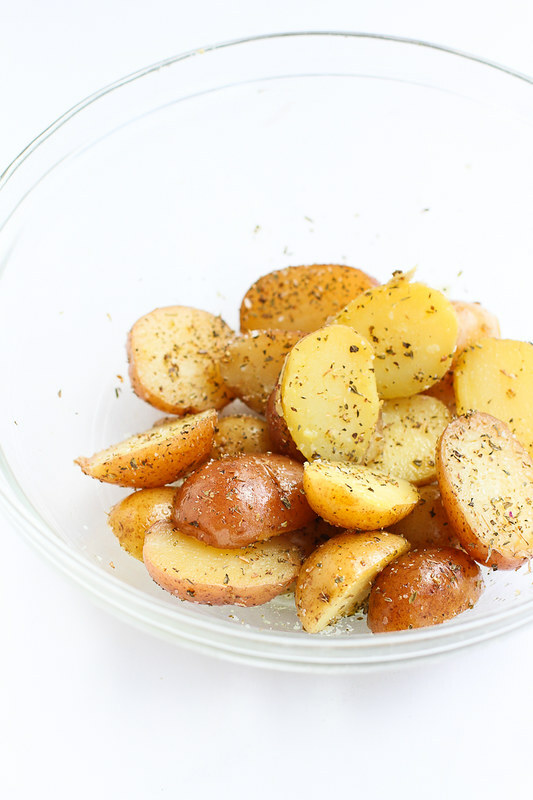 Once cool enough to handle, toss the potatoes with olive oil, oregano, salt and pepper, then sear them on the grill for a golden brown, slightly crispy exterior. You might want to make extras because it’s nearly impossible not to eat a few on their own, dipped in a little ketchup. For the rest of the salad, use whatever vegetables are in your fridge. I used a base of spring lettuce and cherry tomatoes, but grilled vegetables (think zucchini, peppers, mushrooms or asparagus) or raw ones (cucumber and bell peppers) on a bed of spinach or kale would work well, too. In a small bowl, whisk together the balsamic vinegar, Dijon mustard, agave nectar and salt. While whisking, slowly pour in the olive oil. Disclosure: This post is sponsored by The Little Potato Company as part of their ambassadorship program. This post contains links to my Amazon affiliate page. Any revenue made from sales through these links helps to support this blog. Thank you! Those sausage and potatoes look FANTASTIC!!! 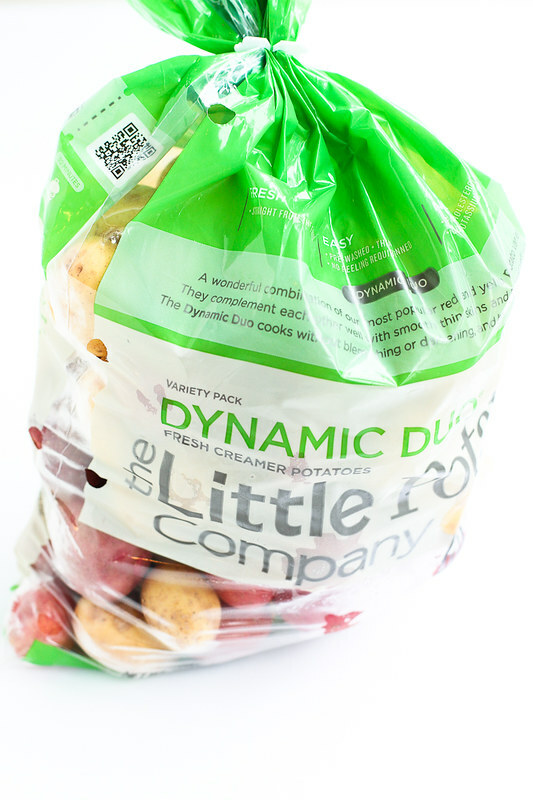 I saw the little potato company potatoes for the first time at the grocery store and they are so darn cute! 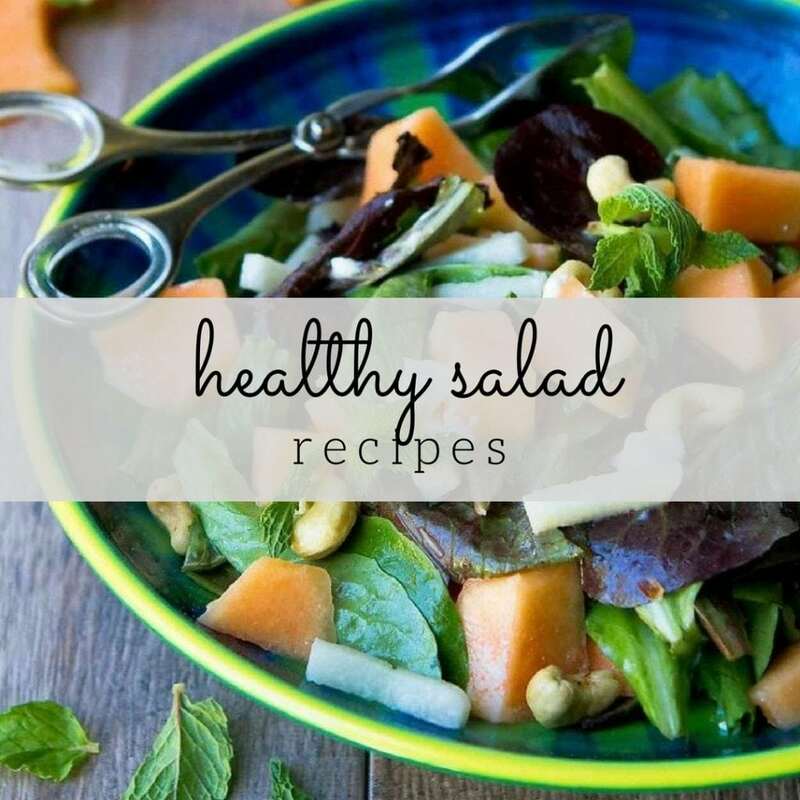 Such a hearty, delicious, full of flavour salad and so easy to prepare. I love having kids help in the kitchen, and this would be perfect for mine to try. It sounds wonderful! We just ran out of propane last night and it broke my heart! I need to refuel so I can make this recipe. I love the creamy texture of these baby spuds. 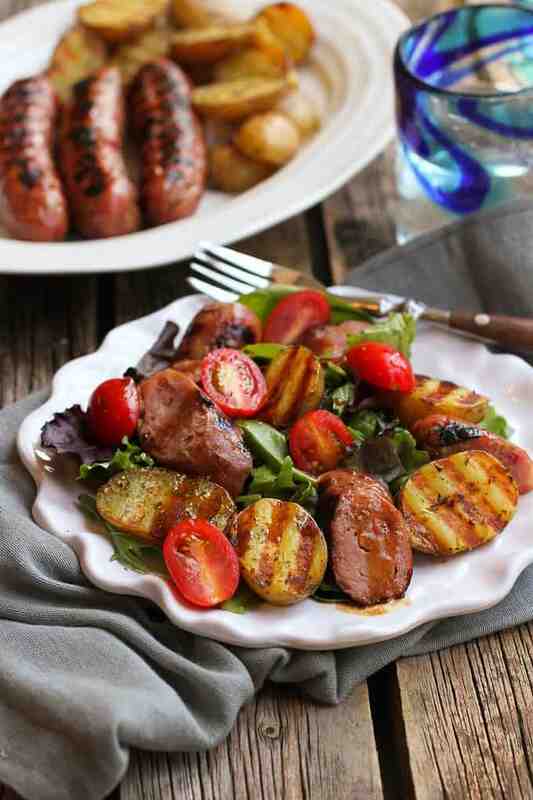 Little grilled potatoes and sausage sound like my kind of meal. And that dressing sounds super lovely with them! 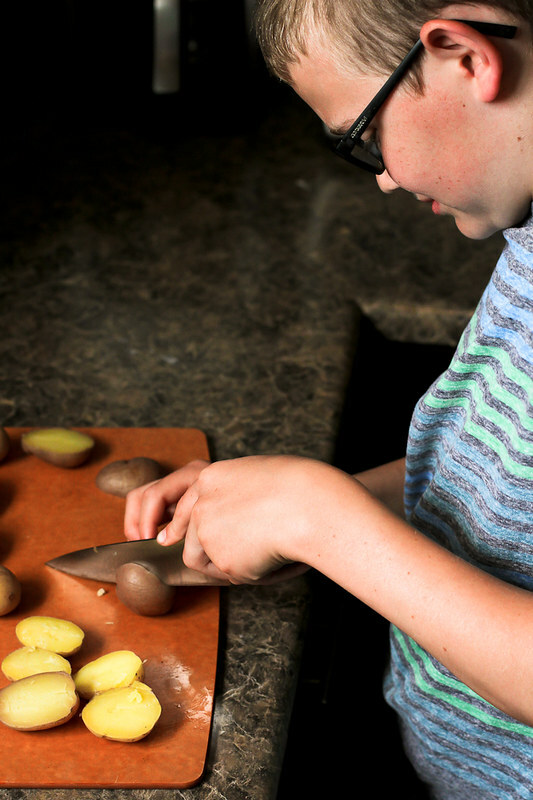 How sweet is it that your boys love to cook! Such a fun family thing you can all do together! 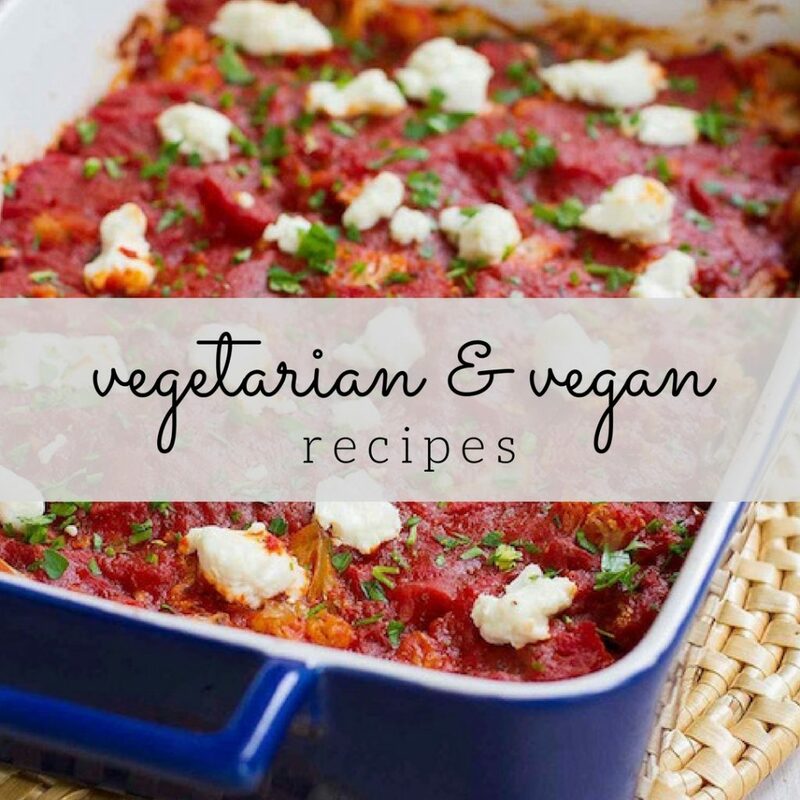 This meal sounds delish and I’m so impressed with their cooking skills!